The Book of Henry has an interesting premise. An 11-year-old boy named Henry (Jaeden Lieberher) is a genius. With an absent father and a mother (Naomi Watts) who's more interested in playing video games and drinking wine than taking care of the family finances, he's basically the head of the house. He's also a caring older sibling for his little brother Peter (Jacob Tremblay), who realizes he's a small dot in his big brother's shadow. One classmate describes Peter as "a nothing." He's actually just a normal, sweet kid, but when compared to Henry, he feels he doesn't measure up, even though he has an inquisitive mind and wants to follow in Henry's footsteps. Both boys are more mature than their mother, who has given over all control to Henry. She can't make any decision -- no matter how small -- without asking Henry what he thinks first. Meanwhile, Henry has come to the realization that Christina (Maddie Ziegler), the girl next door, is being sexually abused by her stepfather (Dean Norris). After several futile attempts at getting the authorities to put a stop to it, he comes up with what he believes is a foolproof, albeit complicated solution. When he's unable to put the plan in motion himself, he enlists his mother's help, but first his mother has to learn what it is to be an autonomous adult who can think for herself. The scenery in this movie is absolutely breathtaking. It's set in a small town, where Henry and his family live in a well-to-do neighborhood because he makes so much money on the stock market. The performances are spectacular as well -- especially Jaeden Lieberher, who grows and shows new depth as an actor with each new project. He specializes in portraying unusual and intelligent children, but Henry is much more than that. Even though he's a genius, he's well-liked by his classmates. He's warm and caring with his brother and mother. Although he spends a lot of time on the family finances, his inventions and making notes in a book and on a voice recorder, he cares very deeply about the people he loves and takes time to make sure they're all okay -- including Christina. Jacob Tremblay shows enormous range for such a young actor and Naomi Watts plays the mother with a carefree, but loving, attitude. Naomi and the two boys have worked together before and their chemistry is evident. They're very comfortable together -- they seem like a real family, which adds immensely to how invested we feel in their lives. 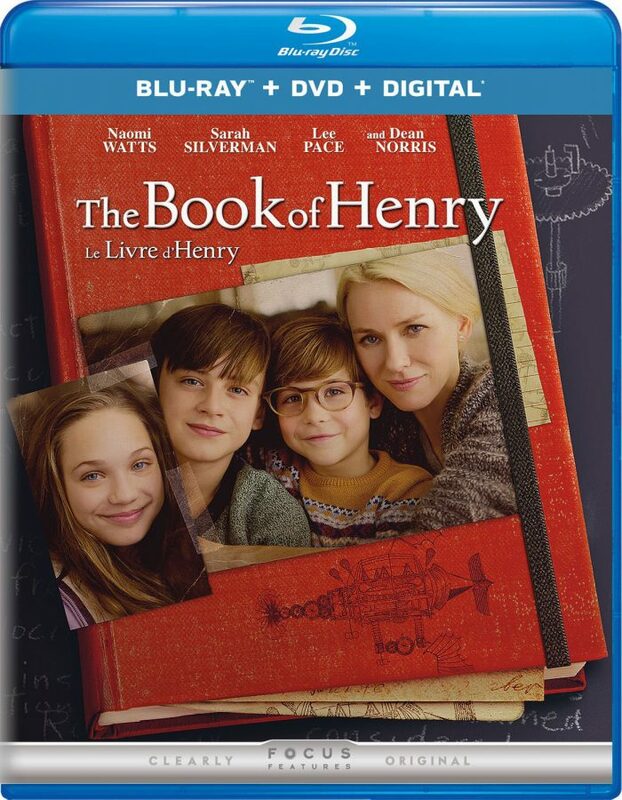 Bonus Features include Filming the Book of Henry and The Book of Henry: The Cast. The latter offers up interviews with the lead actors talking about why they were drawn to the script and their characters in particular.